Alibaba Group’s mission to make it easy to business anywhere has provided small businesses in China with the country’s most efficient path to profits, but is that model exportable to countries in Africa and South Asia for their own digital development? 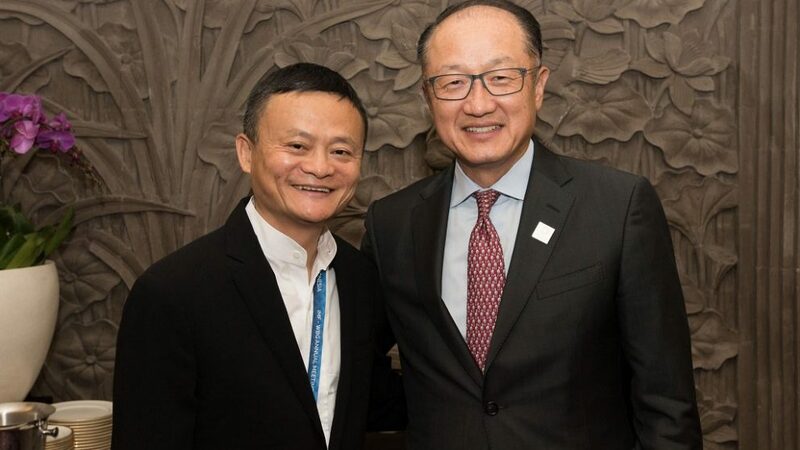 The question was posed to Alibaba Executive Chairman Jack Ma by World Bank President Jim Yong Kim (pictured above) at the 2018 Annual Meetings of IMF-World Bank Group, held this year in Bali, Indonesia. Ma’s answer was a resounding “yes,” thanks to the power of the internet. “I think the internet absolutely is designed for developing countries,” Ma said, speaking with Kim as a part of the “Disrupting Development: Digital Platforms and Innovation” plenary session. The Alibaba founder noted the similarities between many of today’s developing countries and China just 19 years ago, when the now-e-commerce giant started with just 18 employees in Ma’s small Hangzhou apartment. There was no infrastructure for online marketplaces, no mobile payments system, no developed logistics network. But that, Ma said, was an opportunity. “Because there was no infrastructure, that leaves entrepreneurs like us to build it ourselves,” Ma said. “But don’t think you will succeed next year. You have to prepare for 10 years,” he said. Ma said he believes there exists in places like Africa the same chance to build this essential infrastructure. But, just as in China, he called on entrepreneurs to lead the charge. “It’s the entrepreneurs that make business happen, it’s the entrepreneurs that have a dream,” he said. Indeed, Ma said entrepreneurship was one of what might be called his “three Es” for digital development, with the other two being education and e-government. Of course, at least some infrastructure, both in logistics and technology, needs to be in place for entrepreneurs to get a start, he said. But these budding business owners also need training, as well as policies that support their growth. For governments, Ma has supported the growth of the Electronic World Trade Platform, which is a multi-stakeholder initiative that seeks to make it easier for small and medium-sized enterprises to participate in global trade and contribute to the development of the digital economy. The idea was pioneered by Ma and gained recognition by the Group of 20 nations, the United Nations Industrial Development Organization and countries such as Malaysia and Belgium. That focus on digital-first government is as important for the governments themselves as it is for businesses, Ma said. “Government needs to be electronic,” he said, “or they’re not smart enough” to keep pace with changes in the market and technology. Ma also offered advice to those in the audience and those watching via an online livestream, turning to his now-famous “IQ, EQ and LQ” approach to business. IQ is important because it means an entrepreneur can create a business idea that they know is viable and will sustain them through the challenging times that will inevitably come as they build their company. EQ, or emotional quotient, is important because it means an entrepreneur has the people skills necessary to work as a part of and inspire her team. And finally, LQ, or love quotient, is the ethos that drives a business. And for Ma, that means providing a service that may on the surface look focused on only business but also carries with it a spirit of altruism. Focus on those things, Ma said, and entrepreneurs will find success over time.